After a lackluster meal at Thai Confusion, Emily was rather distraught. You see, she really takes eating seriously and any money spent on less-than-stellar food makes her sad. Hence, we needed to find a dessert place fast to elevate her emotional state. However, we just couldn't think of a place. 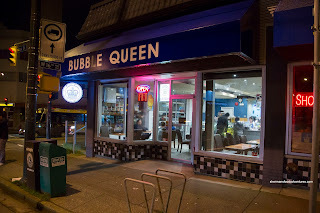 It took a few anxious moments and suddenly it occurred to her that the new location of Bubble Queen on Oak & 16th might be open. Unlike my random food failures, she actually called the place to check first. 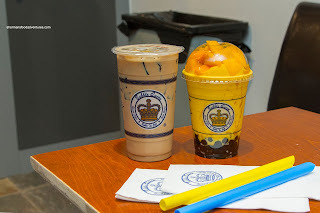 We ended up with ordering one each of the Original Milk Tea with Grass Jelly and Mango Slush with real mango and pearls. 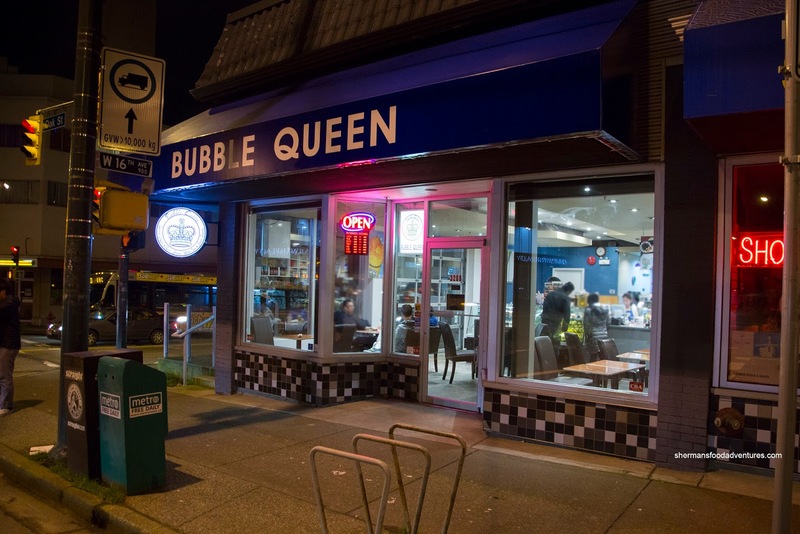 Generally, the drinks at Bubble Queen are not very sweet. So it was by no surprise that the half-sweet milk tea seemed to taste like there was no sugar at all. No matter, it still had enough tea flavour at the tail end. Personally, I prefer gobs of grass jelly over the cubed ones in this particular version. As for the mango slush, it was pretty tasty even though we asked for no sugar. The natural sweetness and slight pungency of the fresh mangoes really came though. The huge chunks of ripe mango didn't hurt things either. Although the drink itself was blended smooth, the pearls were overcooked which meant they were too soft. 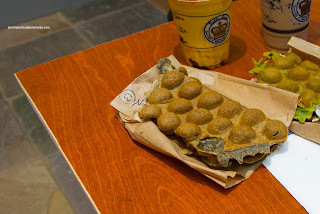 Onto the some bubble waffles, we tried the Black Sesame first. 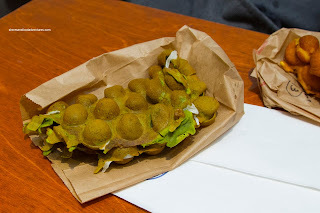 All of the waffles here were more bready and soft than the ones found at Bubble Waffle House and BBT Cafe. Hence, they were more filling and dense. I also found them quite sweet, especially the black sesame. It was indeed aromatic, but wasn't as impactful as I would've liked. The one I liked most was the Mango Puree where every bite was like eating fresh mangoes. I guess that was the point. 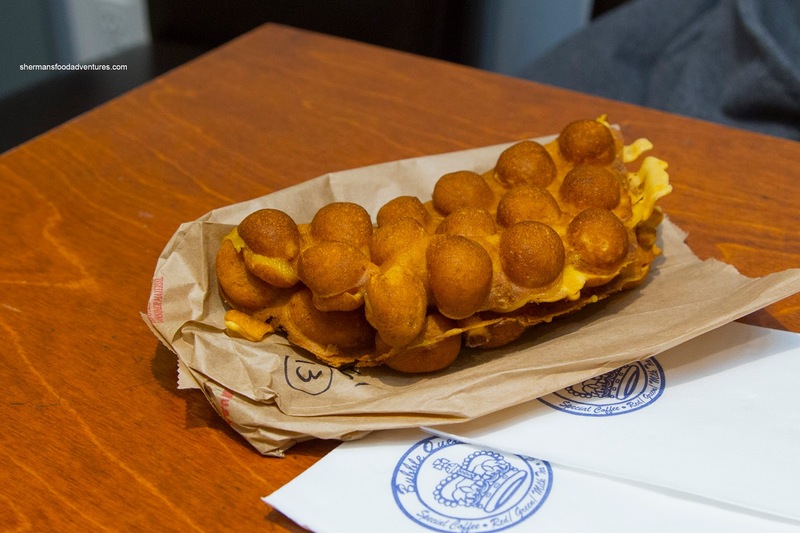 The softness of the bubble waffle actually worked with the puree. I could see that a crispier and chewier version would've interfered the puree texture. Lastly, we had the Matcha Mochi. It was certainly interesting with the melted chewiness of mochi in the middle of every bubble. However, the match flavour was rather weak. On the other hand, the chewiness of the mochi kept each bite interesting with texture. Okay, despite the fact this wasn't as good as the Richmond location (maybe growing pains? ), it was still pretty good and hit the spot after dinner.